The UN Multidimensional Integrated Stabilization Mission in Mali (MINUSMA) was established by Security Council resolution 2100 of 25 April 2013 to support political processes in that country and carry out a number of security-related tasks. Launched formally on 1 July, the Mission had a visit in Kidal from Anthony Banbury, Assistant Secretary-General for Field Support. 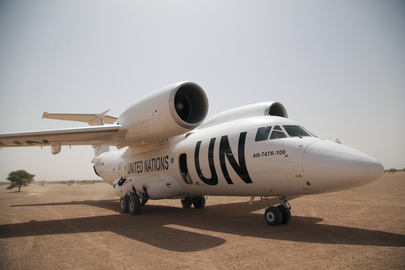 A view of the plane in which Mr. Banbury travelled on the tarmac in Kidal.